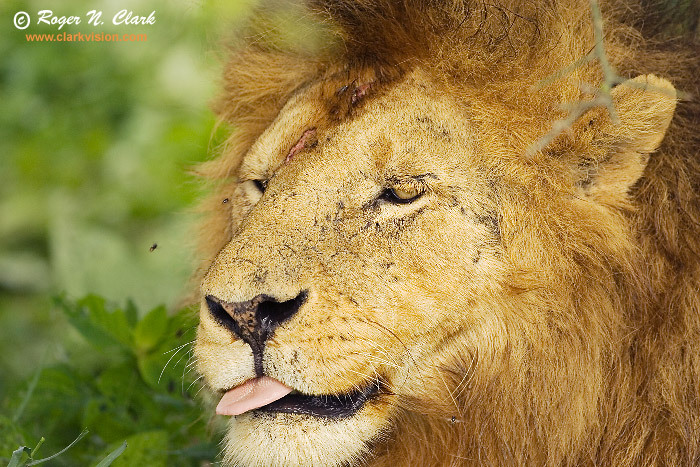 This male lion had just finished a large meal (a zebra), and was trying to relax, but the flies kept bothering him. Here it looks like he is trying to catch the fly. Hmmm...desert! Ngorongoro Conservation Area (NCA) woodlands, on the edge of the Serengeti, Tanzania, Africa. Technical: Canon 1D Mark II 8-megapixel camera, Canon 500 mm f/4 L IS lens. Exposure: 1/1000 second at ISO 200, f/5. Full image, no crop.